You're out of town on business and looking for a good place to eat, so you point your smartphone at the neighborhood in front of you. Not only do you see the camera's view of the streets and buildings on screen, but the buildings within view are highlighted and you can even see what tonight's specials are. You're at a concert enjoying your favorite music by your favorite band. Glance up at the Jumbotron and not only do you see a large shot of the crowd, you also see what everyone's posting to Facebook and Twitter. You're at Epcot, exploring World Showcase with your kids and having an adventure. Carrying specially programmed cell phones, you receive clues and instructions from Disney characters guiding you on a tour around the lagoon--and helping you solve mysteries and foil bad guys. Welcome to the world of augmented reality (AR), the place where virtual stories and information integrate with real life in real time. The term "augmented reality" may be an unfamiliar to you, but the concept certainly isn't. You most likely see a version of it every day. It's the news feed banner that scrolls across the bottom of your TV screen when you watch CNN. If you're a football fan, it's the ubiquitous yellow first down marker that's on your TV, but is completely unseen by the live crowd in the stands. These AR images aren't real...but we've grown so used to seeing them, they kinda sorta are. Superimposed TV images are the most basic types of AR, but there are plenty of others types that are much more complex. Video games are a form of augmented reality--your real life actions affect what happens in an imaginary world--and the Nintendo Wii is probably the best modern day example of it. With the Wii, you don't just push buttons and flick joysticks, you move your game controller to emulate what's happening on screen. You swing your arm, for instance, in the same manner you would if you were really gripping a tennis racquet or rolling a bowling ball. Suddenly, your not just controlling the game, you're part of it. Creative people at numerous technology and entertainment companies are ramping up and pushing the limits of AR. 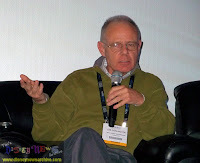 Joe Garlington, Vice President of Interactive Projects at Walt Disney Imagineering (WDI), is one of them. He spoke recently during a panel discussion on AR at the National Association of Broadcasters convention in Las Vegas. Garlington worked at WDI in the 1980s, only to leave a few years later to start his own design and production company. He returned in 1990 and has since racked up numerous theme park credits including Turtle Talk with Crush, the Monsters, Inc. Laugh Floor and Toy Story Mania, all of which require real time human interaction with a virtual world. It's a step beyond passively riding in boats past audio-animatronic dolls and pirates, and it's becoming a style of entertainment more park guests are coming to expect. "Historically," says Garlington, "our audience was families in which the older parts of the audience were technophobes--not very comfortable with games. (They) wanted to sit on the bench and be entertained. But, as our audience is now changing to families where even the adults have grown up their entire lives with game machines in their homes, all of the sudden they expect to be able to participate in these games and activities." One such game at Epcot is Disney's Kim Possible World Showcase Adventure. Using special cell phone "Kimmunicators," players of all ages receive clues to solve mysteries within seven different World Showcase pavilions and help Disney's animated super agent save the world. The pavilions are real, the Kimmunicator clues are virtual, and the objects sought within World Showcase go largely unnoticed except by those playing the game--a perfect example of augmented reality in action. "Within the constraints of certain story structures," says Garlington, "we can create games that feel like you're interacting in a real way with the live character." That works in theater experiences too. Turtle Talk with Crush is Disney's interactive show where audience members talk live with the way-cool reptile from "Finding Nemo." Using AR technology, Crush is fully animated on-screen, moving and responding to audience questions in real time. He's operated backstage by a cast member with the help of carefully placed cameras and microphones, but there's never any hint that what's happening in the theater isn't 100% real. It's a neat trick, but will there ever be a Turtle Talk that doesn't require a CM to assist? Is there a Crush out there somewhere with the potential for artificial intelligence? Maybe, thinks Garlington, but not for a while. "There's both an art and a science to it," he says. "The science part of AI is a long way away and there's a lot of real smart people who have worked a long time to get that figured out." Still, even in the short term, there's unlimited potential for AR in the Disney theme parks. Information kiosks, virtual park tours, more interactive rides and attractions. So, Joe, what are you working on right now? With a smile, he says, "We're interested in all those things." Apparently, augmented reality will never take the place of real-time secrecy. Explaining his success, comic book legend Stan Lee has no time for false modesty. "First of all, you have to start by being incredibly brilliant." He says it with a wink and a smile, but he's really not kidding. 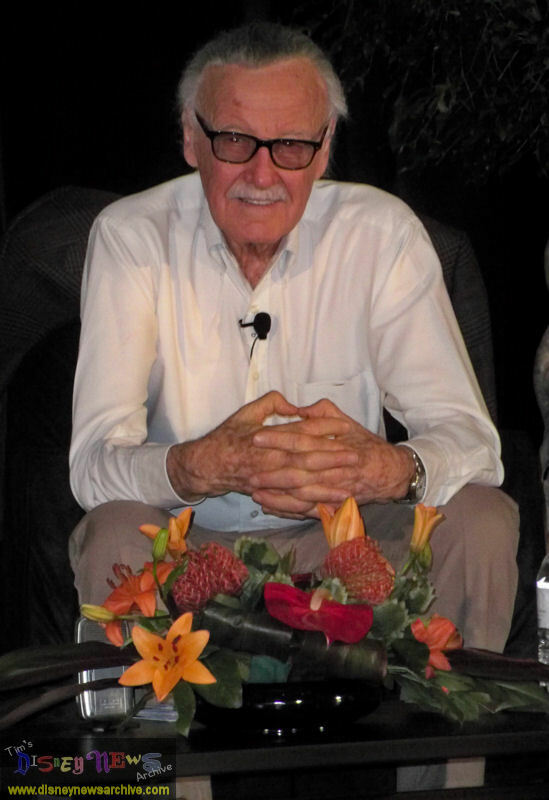 In the world of superhero fanboys, there are few people as idolized and revered as Stan Lee. 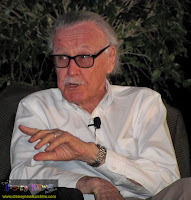 The co-creator of such iconic characters as Spider-Man, The Fantastic Four, The Incredible Hulk, X-Men and many others, Lee spent over 65 years at Marvel Comics as editor-in-chief and publisher, and remains the chairman emeritus of Marvel Enterprises, Inc. In 2005, he co-founded POW! Entertainment, an independent media company that develops movie, television, home video and online properties. POW! created the digital comic book "Time Jumper" with Disney and is currently working with them on several other projects--none of which he can talk about. "And it frustrates the hell out of me," says Lee. At last week's National Association of Broadcasters show in Las Vegas, Lee sat down for a conversation with Chris Hardwick, host of G4TV.com's Web Soup. At 87-years old, Lee is sharp, funny, honest, and is clearly having more fun than anyone else in the room. And that's hard to imagine, considering the audience is comprised mostly of 30- and 40-something males paying tribute at the Church of Stan. 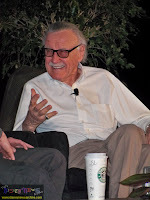 Even yours truly had a hard time keeping his geek under control, but during the audience Q&A, I was lucky enough to be able to ask Lee about Disney's recent acquisition of Marvel. Below are excerpts from this very entertaining interview. In the 1940s, being in the comic book business, it was like Rodney Dangerfield. You got no respect. I'd go to a party with my wife and somebody would come over, "Hey, what do you do?" I knew what was going to happen, so I'd say, "I'm a writer," and try to walk away. And they'd say, "Oh, what do you write?" So I'd say, "Magazine stories," and I'd walk a little further. They'd keep following me. Finally, I had to say "comic books," which at that time the person would turn around and walk away. My publisher told me back in those early days..."Stan, don't use words of more than two syllables. Don't give me talk about characterization and plot. Give me a lot of action. I want a lot of fight scenes, because our readers are either really young kids or illiterate adults." Nobody ever thought that anybody who was educated would read a comic book--and that was the business I was in. ("The Fantastic Four") was the first book we did where I said, "The hell with it!" I'm going to let them talk like real people might talk and react to each other and have personalities and so forth. I was trying to be realistic in the sense that if Johnny Storm, the Human Torch, was going to drive a car, it wouldn't be a whiz-bang V8, it would be a Chevy Corvette. And then, if they'd go to a movie, they wouldn't go to the Bijou, they'd go to the Radio City Music Hall. And they lived in the east side of downtown Manhattan instead of Metropolis or Gotham City. I wanted it to be realistic. Where did the idea for Spider-Man come from? I have told this story so often, that for all I know it might even be true. I was trying to think of a new hero and we had done everything. We had the Thing, who was the strongest guy around. We had the Human Torch, who would burst into flames and fly. We had the Hulk. I thought, "What can I do that's different?" And it occurred to me while I was sitting at my desk, I saw a fly crawling on the wall. Now, I don't want you to think my house is filled with flies--it was one little fly...And I said, "Hey, wouldn't it be cool..."--no wait, I'm lying. In those days, there wasn't the expression "cool." I said, probably, "Wouldn't it be groovy if a superhero could stick to the wall like a fly?" So, I said, "That's a good idea!" But Fly-Man didn't do it for me, so I went down the list: Mosquito-Man, whatever insect I could think of. And then I got to Spider-Man. Now, I want you to think (lowers voice), "Spider-Man." I mean that sounds dramatic. It had to work. So, I said, "I'll call it Spider-Man." And lo, the legend was born. Now, this will sound terrible, but every one of them worked. I never had a rejection, but it's not as good as it sounds and I'll explain. I was the editor-in-chief. I was in charge creatively. I'm also my biggest fan. So, if ever I would come up with an idea, I'd say, "Gee, that's great! Let's do it!." I was the guy who said "let's do it." So, everything I did I thought was terrific. So, I got no rejections because I would've been the rejector--and I'm not going to reject my own stuff. I was writing almost all the stories for all the characters and, fast as I am and wonderful as I am, I was having trouble keeping up. Now, the artists were freelancers. They weren't on salary, which meant if they had nothing to draw, they weren't getting paid. So, if Steve Ditko was waiting for a script for Spider-Man and I am still writing the Hulk for Jack Kirby, let's say, Steve had nothing to do and wasn't getting paid. So, instead of me waiting until I finished the script for Jack Kirby, I would say, "Look Steve, I'll tell you what. Here's the plot I would like for Spider-Man. Let so-and-so be the villain. Let this happen. You go ahead and draw it any way you want to. I'll fill in the dialog later." So, I was able to give Steve something to draw while I finished writing the Kirby script. When Steve brought his artwork in, all I had to do was put in the dialog and the captions--maybe make a change or two, but that was it. So, I realized I can do that for most of my artists. I could give them the plot and let them draw it any way they wanted to and then I would put in the dialog. So, in that way, I kept a lot of guys working at the same time. And I began to realize it's the best system of all because instead of me writing a complete script and saying, "Panel H2, draw a closeup of this and a long shot that and a medium shot that," let the artists decide what to do. That's why they're artists. They're good at it. And they all had great story senses. I worked with the best in the business. They made me look good, thank God. Every form of the media tells a story in ways that the others can't. I mean, a movie tells a story in a way that a television show can't. A television show tells a story in a way a magazine can't. They're all different. A comic book is really like when you do storyboards for a movie. The good thing about comics now, people in Hollywood really don't have the time--and most of them don't have the interest--to read a full script. So, if somebody wants to sell a script to a movie company, a distributor, a producer, there's very little chance the guy is going to read it. But, it's so easy for anybody to look at a comic book. You can thumb through it in a couple of minutes and say, "Hey! Wow! These pictures are great! Oh, that scene would look terrific on screen. There's a lot of action. Yeah, I want to do this movie!" I thought it was a great job. Sam Raimi really kept it true to the spirit of Spider-Man. He only made one blundering mistake, but I forgive him for it. I understand how it was. He didn't make me play the part of J. Jonah Jameson, the irascible newspaper editor. And I was born to play that role, just like I'm amazed they don't have me playing Odin in the Thor movies. I don't know how many of you have been to a comic book convention lately, but the way they used to be, they were all kids, little kids, and occasionally you'd see an adult or two--the parents who the kids dragged to the place because they were too young to come by themselves. Now, all you see are grown-ups with a few kids that they couldn't leave at home because they couldn't get a babysitter. It's a totally different thing. For example, the biggest convention is the one in San Diego (Comic-Con). There are over 150,000 people there, I think. And it's all movie people, television people, media people. And they're all looking for the next hot movie, next hot TV show. And the poor kids, they're outside with their noses pressed against the window because they can't get in. I think the Disney acquisition of Marvel is a very good thing. The people at Disney are very smart and they're very powerful. And they know enough to let Marvel do what Marvel does. They don't interfere. But now, Marvel has all the weight and the power of the Disney distribution machine and all the things that Disney can offer. A lot of people think, "Oh, now Spider-Man is going to have Mickey Mouse ears." It's nothing like that. Nothing will change except for the better. Marvel will do what Marvel does, but they've got Disney behind them, supporting them. And I've worked now with the Disney people for a few years, and I've got to tell you they're great. They're very creative. They're very understanding. They know the market. They know what they're doing. A lot of people do come over to me and they say, "Gee, I want to thank you for the stuff you wrote years ago, because it meant so much to me, and it affected my thinking and it affected when I was unhappy and confused, and I read these stories and I felt better." I'm not sure how that happened, because I wasn't trying to write therapeutic stories. But, if people felt that way, I'm very glad about it. With the X-Men...there was an underlying theme of anti-bigotry, but that was an underlying theme. I was really, mostly trying to just tell an exciting story. And with Spider-Man, I was again trying to tell a story that people would enjoy reading. But, I find no matter what you write, people read things into it that you may not even have consciously put there. I don't think it hurts anything. Everything changes things. I think there will always be comic strips the way there'll always be books, there'll always be movies, there'll always be television. I remember when TV first came out, everybody said, "That's the end of books. Nobody's ever going to read a book. They're just going to stay looking at their TV screen." There's still a book business. Whether this is good or bad, I don't know, but there'll always be comics. They may not be as big as they were, or they someday may be bigger than they were. You know, a lot of these movies that are based on comics make people who enjoy the movie want to go read the comic book series. So it works both ways. One hand washes the other. I love technology. I don't understand it. I'm no good at working anything, but I love the idea of all these new things. And all that they do is keep people interested in new ways of looking at a story, of being involved in a story. And with video games, they're part of a story. So it's a fascinating age we live in. It really is. One piece of new technology Stan Lee has kept up with is Twitter. His feed is one of the most entertaining ones out there. Follow him at www.twitter.com/therealstanlee. 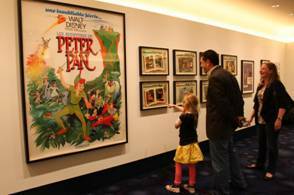 Faith, trust and pixie dust get the spotlight now through June 27th at the Walt Disney Family Museum in San Francisco. An exhibit dedicated to Disney's 1953 animated classic "Peter Pan" will include 16 original concept drawings by Mary Blair along with "character sketches, storyboard outlines, original concept art, model sheets, and vintage posters." 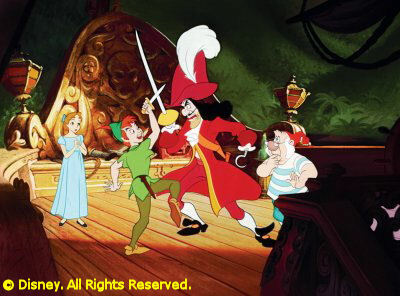 "Peter Pan" will also be the film of the month showing in the museum's theater during the month of May. On May 22nd, the museum will host a special appearance by Disney Legend Kathryn Beaumont, who provided the voice of Wendy Darling. She'll be on hand not only to discuss her voice work on "Pan," but also her experience as the voice of Alice in "Alice in Wonderland."